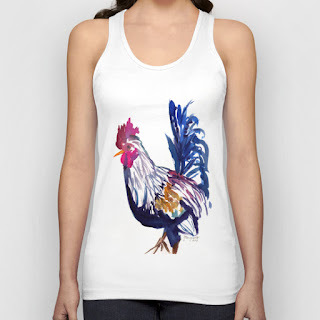 Get ready for summer with these new tank top designs! 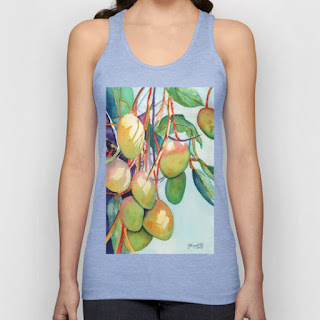 For more Tank Top designs please visit: http://society6.com/marionettetaboniar/tank-tops and for more products featuring my art including: t-shirts, tote bags, mugs, art prints, phone cases, throw pillows, framed prints, canvas prints, and wall clocks, please visit http://society6.com/marionettetaboniar . More of my designs are currently being added as time permits. 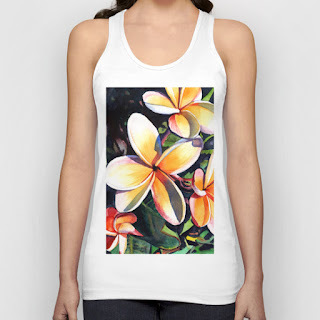 All items are made and shipped from California by Society6. Looks messy, right? But the outcome is fun. First I start with a little alcohol ink on a blank piece of Yupo paper. Then, I try to wipe it away with alcohol and a tissue to create a very light colored but semi-textured image. 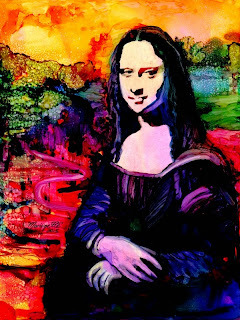 Next, I draw in my design (the Mona Lisa) and mask off the light areas with masking fluid. This is when the fun starts!! With the light colors being preserved, I am free to drip, drop, scrape, and manipulate the alcohol inks around the painting. I often use a q-tip with alcohol on it to soften areas, and I use some alcohol ink pens to draw with. But, the most fun part is putting some alcohol on a tooth brush and flicking it so that the droplets interact with the alcohol inks to make interesting designs. The next step is to, of course, remove the masking fluid and fix up any areas that need a little work. The original painting can be found at my Etsy shop at https://www.etsy.com/listing/232055401/alcohol-inks-on-yupo-painting-abstract?ref=shop_home_active_10 and my other alcohol inks on Yupo paintings can be found here https://www.etsy.com/shop/kauaiartist?section_id=15832235&ref=shopsection_leftnav_6 . 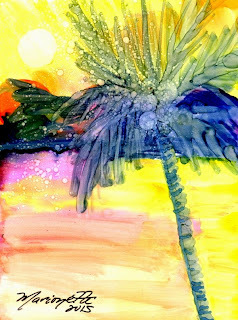 If you are on Kauai, you can also join me for a class in Alcohol Inks on Yupo paper. Here is my art class schedule http://www.kauaiartclasses.blogspot.com/ . I also teach it as a private lesson. Feel free to contact me at 808-631-9173 if you are interested. I hope you have enjoyed this demo! 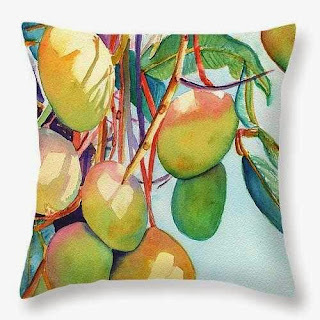 Decorate your home with these fun and tropical throw pillows. 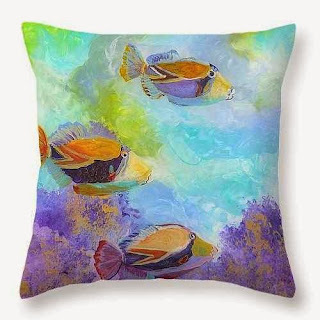 They are made from 100% cotton fabric and add a stylish statement to any room. 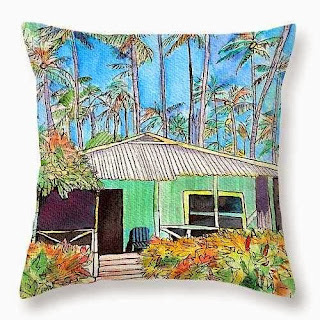 Pillows are available in sizes from 14" x 14" up to 26" x 26". Each pillow is printed on both sides (same image) and includes a concealed zipper and removable insert (if selected) for easy cleaning. 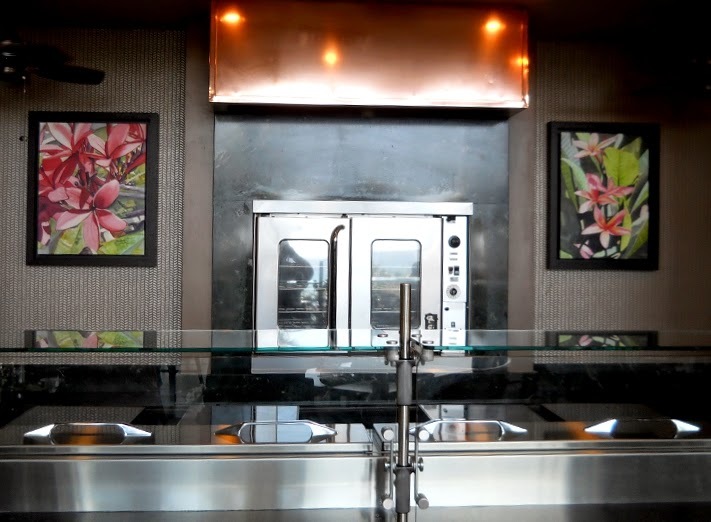 I'm so happy to announce that my art work was chosen as part of the permanent decor at the Ilima Terrace restaurant at the Grand Hyatt Kauai Resort in Spa in Poipu. 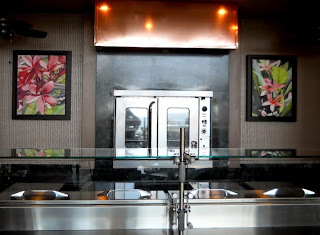 The designer selected five pieces of my art to decorate the breakfast buffet area. Mahalo!! 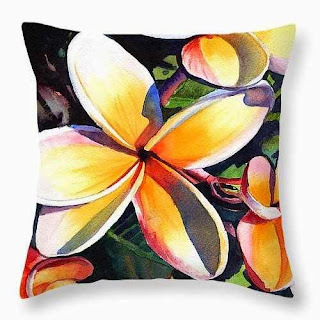 For canvas prints, framed prints, metal prints, cards and more featuring my art, please visit http://marionette-taboniar.artistwebsites.com/ , and for original art and prints directly from my studio, please visit https://www.etsy.com/shop/kauaiartist . 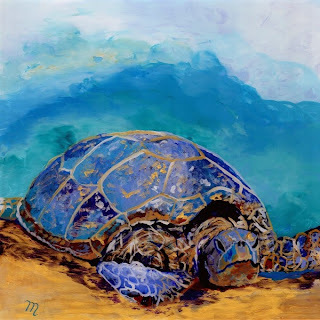 Check out my newest prints featuring a Hawaiian Sea Turtle who was sunning himself at Poipu Beach on the island of Kauai a few weeks ago. 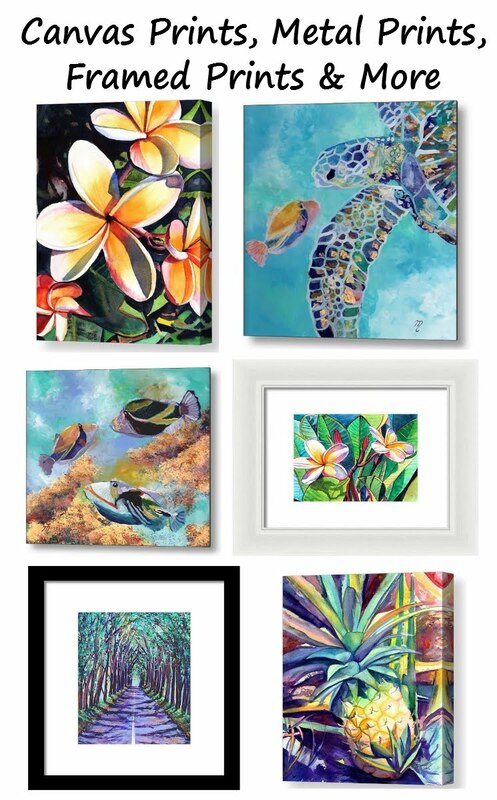 Find these prints and original art at my Etsy Art Gallery https://www.etsy.com/shop/kauaiartist . These three new designs of mine are now available as prints directly from Fine Art America. 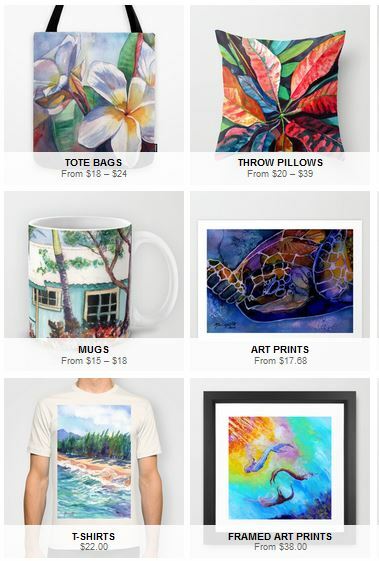 They offer canvas prints, framed prints, acrylic prints, metal prints, greeting cards, phone cases, pillows, and more! 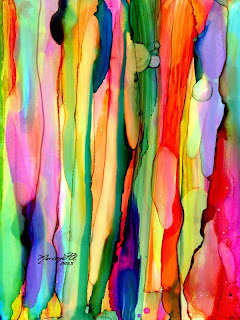 My next Alcohol Inks on Yupo paper class is scheduled for Saturday, May 23, 2015 from 11am to 1pm at my art studio, Painting Paradise, located in Waimea, Kauai. (Or we can always do a private lesson.) For directions http://www.kauaiartclasses.blogspot.com/p/map-directions.html . 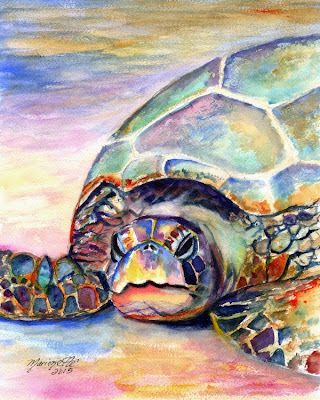 For a current schedule of my art classes, please visit http://www.kauaiartclasses.blogspot.com/ .